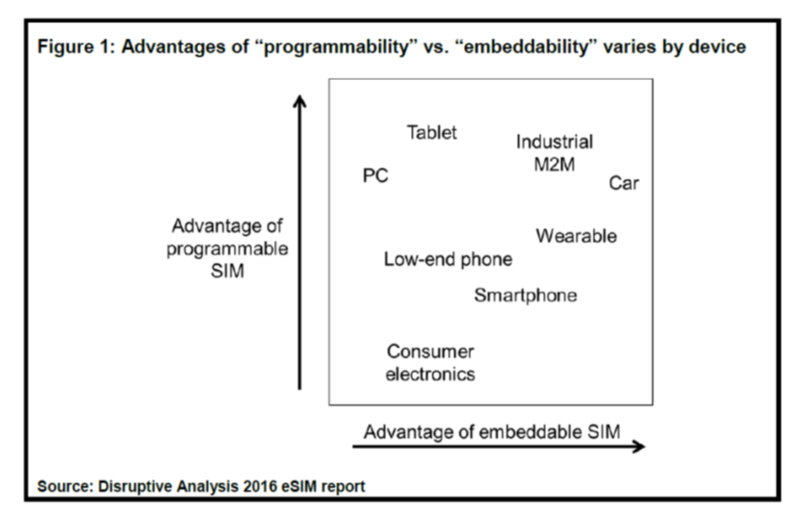 Disruptive Analysis has published a 36-page report on the emerging technology of eSIM and SIM remote-provisioning. The focus is on the use-cases, practicalities, drivers and obstacles for bringing eSIM-based devices to market, alongside suitable mobile data plans or subscriptions. The report addresses both the motivations (lower costs, higher revenues, better experience) and problems (business-case, user journey, regulation, transition) that will be experienced by operators (MNOs) and device vendors (OEMs). 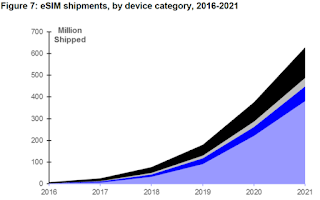 Forecasts are given for annual shipments of eSIM-enabled devices (phones, wearables, M2M, tablets), and for the installed base that will be a target for after-market eSIM provisioning. eSIM adoption will have a slow start. 2016-17 consumer deployment will mostly be early concepts, allowing MNOs and OEMs to gain practical eSIM experience and refine implementation and processes. eSIM phones will emerge very gradually. Adoption should ramp up in 2019-2021 as cost, industry value-chain and user-experience problems are progressively solved. Apple and Samsung are unlikely to use eSIM to become MVNOs / carriers. Neither will they aggressively push eSIM into their flagship products. For many M2M/IoT devices, the eSIM decision is secondary to justifying the extra cost, space and power needs of the cellular radio itself. eSIM is "necessary but not sufficient" to drive adoption of cellular M2M. It is unlikely to change the competitive dynamics vs. LPWAN technologies like SigFox or LoRa. There remain unanswered questions about regulation, customer-support and business model for eSIM. Although some projected cost-savings are attractive for operators, it is unclear that it will help OEMs generate extra revenues/loyalty. Most eSIM-enabled smartphones will be hybrid eSIM / removable-SIM. 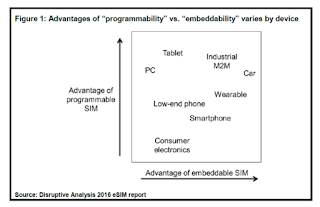 By 2021, 630m mobile & IoT devices will ship with embedded SIMs annually, driven mostly by smartphones, although vehicles and tablets show growth earlier. In a nutshell: eSIM is an important evolution for some use-cases, but it is neither an outright "game-changer" nor a major risk to traditional cellular business models. What is eSIM / eUICC? Payment is via credit-card and Paypal (see below), or send a purchase-order and invoicing details by email to information at disruptive-analysis dot com. The report will be emailed to you within 24 hours of receipt of payment. PLEASE NOTE - DISRUPTIVE ANALYSIS IS CLOSED BETWEEN 20/12/2016 & 5/1/2016. ANY ORDERS IN THIS PERIOD WILL BE FULFILLED IN JANUARY.